Urostigma elasticum (Roxb. ex Hornem.) Miq. E. Asia - India, Bhutan, Nepal, Myanmar, Malaysia, Indonesia. 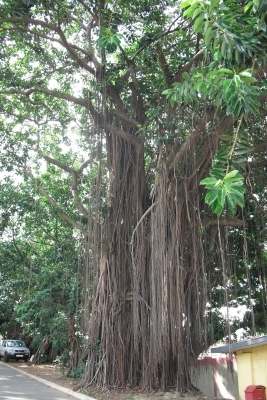 The symbiotic relation of Ficus spp. With specialized wasps is well-known. Figs can only be pollinated by female agaonid wasps (Hymenoptera, Chalcidoidea, Agaonidae). These wasps are highly species-specific; the fig-wasp associated with Ficus elastica is Blastophaga clavigera, known from India. In Ficus elastica the wasps arrive when female flowers are receptive. They enter the fig via the osteole, a bract-covered apical pore. Once inside they pollinate the female flowers and deposit their eggs in the ovaries. As style length varies greatly within these figs and because the wasp can only reach the ovary of short-styled flowers, only some of the flowers obtain an egg, while in others the seed develops. Male and female wasps emerge after a few weeks, and mate within the fig. The females then emerge from the fig and, in so doing pick up pollen from the newly mature anthers of male flowers. Figs on a single tree mature at the same time, while different trees of the same species flower out of synchrony, thus inducing cross- pollination. what is the flowering season/time of Ficus elastica?